.308 serves police and military marksmen, Palma competitors, F-Class shooters, and deer-hunters equally well. The .308 Win delivers superb accuracy along with outstanding barrel life--it's not unusual for a .308 barrel to return 5,000+ rounds of accurate service. Along with excellent factory-loaded ammo, a huge selection of bullets and powders is available for the .308 Winchester reloader. Loading for the .308 Win is relatively easy. The round is not finicky and great powder and projectile combinations are well-known. For a 6BR, there is one clear choice in brass--Lapua, with Norma the only real second choice. 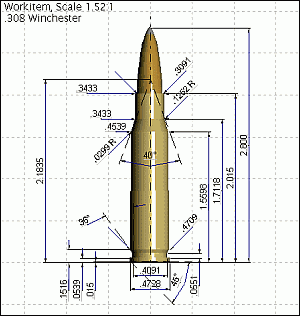 For the .308 Winchester, choice of brass is not so simple. Most of the .308 Win precision shooters we've interviewed do prefer Lapua brass, but others are very happy with Norma, Winchester, Hornady Match and even Remington. Black Hills uses Winchester-made brass for its match ammo, which is capable of .5 MOA or better in many rifles. 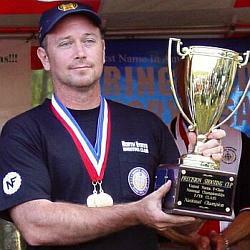 The main advantage of Lapua brass is consistency and quality. Case-wall thickness is very uniform and most lots have shown less variation in weight than other headstamps. But Winchester brass performs very well in the .308. And, at $24/100, Winchester costs 40% less than Lapua brass. Even if you can potentially get more loadings out of a Lapua case, Winchester brass offers more bang for the buck. You'll find a lot of once-fired Federal Gold Medal Match brass available. While it tends to shoot accurately, we've found GMM brass is relatively soft compared to Lapua or Winchester, so the primer pockets tend to loosen up after just three or four reloadings. In addition to commercial brass, many .308 Win shooters reload boxer-primed military cases such as Lake City, IMI, and Hirtenberger. The Lake City Match brass is pretty good. Some lots have been excellent. The standard Lake City fodder is inferior to Winchester. IMI brass has a reputation for being strong, but we advise you only to purchase it new. Some used lots of IMI brass from Israel have been defective. If you are looking for ultimate accuracy, IMI will probably disappoint you, though it's good for gas guns that are tough on cases. The most important thing to remember about military brass is that the internal capacity will probably be less than commercial .308 Win brass, because military brass often has thicker webs or casewalls. Montana Marine reports his fire-formed milsurp cases hold 56 grains of H20 on average compared to 58 grains for fire-formed Winchester. Given the reduced capacity of military brass, you should reduce posted max loads by 1.5 grains when loading with Lake City or most other milsurp brass. However, the IMI MATCH brass is closer to commercial brass in internal case capacity (ICC). Kevin Beggs reports: "Fired, my IMI Match brass runs with an ICC of 55.0gr and bumping the shoulder back .001" will net me an ICC average of 54.0gr. LAPUA runs an average of 54.4gr and Federal runs an average of 54.3gr ICC." What you see below is just a fraction of the quality 30-caliber match bullets available to .308 shooters. Figure there are at least twenty projectiles you might consider. Still, with such a large selection, nearly all the competitors we interviewed were using one of five bullets: 155 Berger, 155 Lapua Scenar, 155 Sierra MK, 168 Sierra MK, or 175 Sierra MK. A few guys have had good luck with the 168gr Amax (.475 BC), and some guys like to shoot the heavy 185gr Bergers (.569 BC), 185gr Scenars (.521 BC), or 190gr SMKs (.533 BC) at 1000 yards, but the vast majority of .308 shooters are running the 155s, or the 168 or 175 Sierras. Among the 155s, John Whidden has had great success with the Bergers seating them well in the lands. The Lapua 155 has an impressive .508 BC (and you can see that it is even longer than a 175 MK), and you can launch it much faster than a 168- or 175-grainer. Between the 168 SMK (.488 BC) and 175 SMK (.505 BC), most shooters seem to think the slippery 175 is a better bullet overall and it definitely has an edge at longer distance--less drop and less windage. We suggest, in developing initial loads for your .308, that you focus on one of these five projectiles, and then maybe try a few Amaxs or the heavier SMKs. Sierra will start selling a new 210gr SMK early next year. It's probably a little heavy for a .308, but it should work very well in a 300WM or 30-06. The major bullet manufacturers, Barnes, Hornady, Nosler, Sierra, Speer, and Swift provide a wide variety of hunting bullets in .308 caliber with weights ranging from 100 grains or so to 240 grains. For smaller game and varmints, the Sierra 110gr Varminter bullet has proven very accurate. 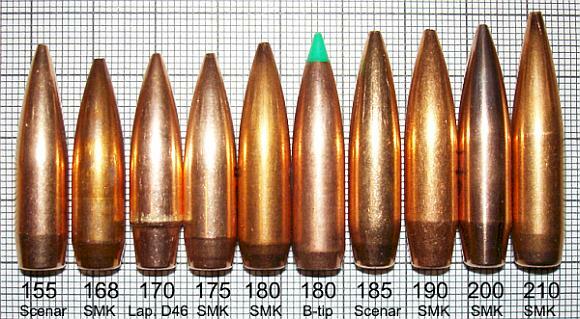 For deer-sized game, a bullet in the 150-grain range (such as the Swift Scirocco) running 2850+ fps is very effective. Reader M700 tells us: "Something that is deadly accurate and has fast expansion gets my vote for mid-longish range deer hunting. Say either a Nosler Ballistic Tip or a Sierra SPBT GameKing. Both have the reputation for fast expansion and excellent accuracy. With a decent .308 Win you can boot the 150 up to around 2900 fps and get excellent accuracy as well as deadly on-game performance." The Hornady 165gr SST, with its excellent .447 BC, is another good choice for longer-range shots on deer. For Elk and large game, select a heavier, controlled-expansion bullet such as the 180gr Nosler Partition. One of the great things about the .308 Win is the availability of high-quality factory-loaded ammo. Using 168gr Federal Gold Medal Match this editor managed to coax a .75-moa group from a FAL clone with iron sights. Many shooters who don't have the time to reload shoot GMM or Black Hills exclusively, and they hold their own in tactical competitions. Jacob Gottfredson, noted writer for Precision Shooting, told us that he often uses Black Hills match ammo in competition: "In tactical matches, an extra quarter-MOA of accuracy (from handloads) won't make you a winner if you can't range the targets and dope the wind. 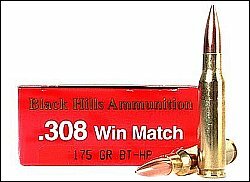 You could shoot 175gr Black Hills the whole match and easily end up with a trophy". Along with Federal and Black Hills, Lapua makes truly outstanding .308 match ammunition fitted with 155gr, 167gr, or 185gr Scenar bullets. The Lapua ammo is capable of shooting under half-MOA in a good rifle. It costs about $25.00 per box of 20 from Grafs.com. For great prices on Federal GMM ($16/20 for 168s) go to OutdoorMarksman.com. So which factory ammo is the best? Chances are you should try Black Hills, Federal and Lapua and let your gun decide. SniperCentral.com recently conducted a Match Grade Ammo Comparison test, including M118 LR, used by U.S. military snipers. 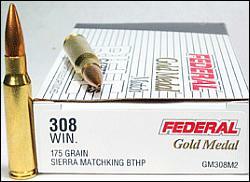 The tester concluded: "The Federal Gold Medal Match is still the standard by which all other match ammo is judged. How they can get such good accuracy and consistency from such mass produced ammo is a mystery to me. Black Hills match grade ammo is right up there with Federal, is just as consistent, and in my particular rifle, is just as accurate, though I cannot say its any MORE accurate than Federal. It's a good alternative, with the price per box about $2 cheaper than Federal. The HSM ammo is the cheapest of them all by a large margin (about $5 cheaper then Black Hills, and about $7 cheaper then federal per box). But it's also not nearly as accurate. You can expect the same accuracy as M118, and it makes a good replacement for those that cannot get M118." For the 160-175 grain boattails used by the majority of .308 shooters, you want a powder of medium burn rate that gives close to 100% load density. The "classic" .308 load for 168gr SMKs is IMR 4064 with Federal primers. However, these days Varget is probably slightly more popular. Lot variance has frustrated Varget users, however. Jerry Tierney has had to tweak his .308 Palma Varget load up to two full grains to maintain optimal velocity. Tech Note: If you use QuickLOAD, we suggest you select data for ADI 2208 rather than Hodgdon Varget. This, we've found, will give more realistic numbers. In addition to Varget and IMR 4064, a half-dozen or more other powders work extremely well in the .308 case: AA 2460, BLC-2, IMR 4895, Reloader 15, Ramshot TAC, VV N150, and VV N540. Some folks are seeing a little more velocity with RL15 than with Varget, but Varget is still less temperature sensitive--important if you're running near max. Most of the guys we know shooting the Sierra or Lapua 155s are using Varget. For Sierra's 110gr Varminter and other light bullets, you can use a faster-burning powder such as Benchmark or VV N135. In general, the .308 seems to achieve its best accuracy with case-filling loads running pretty stout pressures. For safety's sake, always start at least 10% below recommended maximums, and watch for pressure signs carefully. Often you can be over-pressure even without tell-tale signs on the primer cup. One trick we use is to take a shell-holder to the range. After firing a test case, if you have difficulty sliding it into the shell-holder, the web has expanded excessively, meaning your pressure is too high. For a good selection of "safe" loads, click on the Sierra icon to download Sierra's .308 Winchester Load Map. When choosing a load to test, keep in mind that seating depths can make a HUGE difference in pressure. Remember that seating bullets into the lands can raise pressures but moving 0.020" or more AWAY from the lands can also raise pressures, because you are reducing the effective case capacity. Many readers ask us "should I jam or jump my bullets." There is no right answer for every gun. For every guy getting great results at .015" jam, there is another guy doing well with a 0.025" jump. In general, most popular .308 match bullets (Bergers excepted) are tolerant of jump. This is certainly true of the 168 and 175 SMKs. So don't worry that you may be sacrificing a great deal of accuracy by loading to mag length, even if that puts you pretty far from the lands. We wish we could say something definitive about primers--but the truth is both Federals and CCIs are winning their share of matches. Federal 210m, and CCI BR2s have both proven accurate with all the most popular propellants for match ammo. We can say that if you have experienced issues with cratering and primer piercing, go with the CCIs. They have a harder cup. Among other primers, WLRs are used in Black Hills match ammo and they perform admirably. Russian primers are the newest thing to hit the market, and by all indications they work as well or better than the best domestic primers (so long as the rather hard Russian cups are firmly seated to proper depth). Note, Russian primers are currently distributed by PMC and retailed in PMC boxes. However, PMC will not import them after the first of the year. AccurateShooter.com has been informed that a large, well-known foreign ammunition company will take over importation of the Russian primers and they should be readily available by the second quarter of 2006. Reloading for the .308 is straight-forward. The cartridge is very forgiving and performs exceptionally well with a wide variety of powders and bullets. Different applications require different tools and techniques, however. Those shooting semi-auto "gas guns" such as the M1A and FN-FAL clones should full-length size after each firing. Palma shooters, who need to be at near-max pressures to be competitive, should use the strongest brass available and should pay special attention to seating depths. At high pressures, Palma shooters can also benefit from body-sizing or full-length sizing after each firing. Full-length Sizing (Body and Neck): The problem with full-length sizing is that virtually all commercial dies reduce the neck diameter much more than necessary. This results in excessive neck tension and can make bullets difficult to seat smoothly. There are two good solutions to the problem, and neither is very expensive. 1. Purchase a Forster .308 full-length sizing die. Measure a loaded round with a bullet seated, and note the outside neck diameter. Then send your die to Forster and for $10 (plus shipping) Forster will hone the neck to the dimension you specify. For bolt guns, we suggest .002" under the neck diameter of a loaded round. For gas guns, go .003" under. Total cost is about $45.00, including the die. 2. Hornady can make you a custom full-length sizing die for about $75.00 plus shipping. Just send them a few fired cases and a reamer print (if you have it). They can create a die that gives you ideal neck tension, as well as just the right amount of sizing at the shoulder and web. Call Hornady and ask for Lonnie Hummel. Scott Parker recently had a die like this made and he reports: "Average runout for 65 rounds was .0004". All 65 rounds showed less than .001" runout." Neck Sizing Only: If you are not working your brass too much with very hot loads, you can probably get by with neck-sizing only. Bushing dies are convenient and allow you to adjust tension as easily as swapping in a new bushing, but this can contribute to build-up of brass at the neck-shoulder junction. If you do neck-size only, you should experiment with the bushing position. Some shooters get best results only sizing one-half to two-thirds of the neck. Another inexpensive option is the Lee Collet Die. This works by squeezing the neck around a metal mandrel that extends down into the case. Collet dies can produce very low run-out, they don't cause brass build-up at the neck-shoulder junction, and they are inexpensive. However, it is somewhat difficult to precisely control the amount of tension and the collet's fingers can leave marks on your brass. Still, some .308 shooters swear by the Lee die. Neck-Sizing with Optional Body Sizing: Most .308 shooters can get away with neck-sizing only for a while, but after 4-5 firings extraction becomes difficult. Then it's time to size the brass. An inexpensive Redding body die is the way to go. Getting just the right amount of sizing is the hard part--you want to just size the case enough so that it feeds and extracts easily. With some presses, the ram must be set to "cam-over" in order to size the case enough. This means you must first set the bottom of the die to touch the shell-holder, then screw it down a little further, 1/8th turn at a time. Reloader 15 47.0 F210m Hornady 110 V-Max Win 3200 fps Accurate, hard-hitting Varmint Load. Try .010" into lands. Alliant Reloader 15 44.0 CCI BR2 Hornady 168 A-Max Lapua 2700 fps Very Accurate, 1/4 moa to 400 yards. 2.875" COAL. IMR 4064 43.5 F210m 168 SMK Win 2600+ fps Very Accurate in 24" bbl, 2.800" COAL. Alliant Reloader 15 45.0 F210m 175 SMK Win 2750 fps Very Accurate from 24" 5R bbl. With my .308, I tried A LOT of different loads in the first 600 rounds, starting with 42.0-44.5 N150 for the first 200 rounds, then moving to 44.0-45.0 Varget for the next 300 rounds. I tried different bullets (Sierra 175 MKs both moly and naked, Nosler 180gr Ballistic Tips, 175gr Bergers), different cases (Lapua, Federal), primers (Rem, CCI BR, Fed Match), and, oh yes, seating depths (on the lands to 0.10" off, and several distances in between). Even after 500 rounds of testing, I still wasn't satisfied, and frankly, I was growing weary. I finally found my "sweetheart" load on February 14, 2000 (Valentines Day), almost seven months after getting the rifle. This is the load I still shoot today and I shot all weekend at the F-Class Nationals. The break-through came when I discovered that slower velocities produced outstanding accuracy. I found that Varget pushing a 175 SMK at about 2610 fps delivered quarter-MOA groups out to 300 yards and half-minute or better groups beyond that distance. Since developing that load, I've used Lapua cases and Russian primers, but the core elements, 43.0 grains Varget with 175 MKs seated 0.018" off the lands, has not changed. During the first few years I owned the rifle, I was crazy about cleaning. My log shows that I cleaned the barrel 80 times in the first 998 rounds. That works out to cleaning every dozen rounds! No wonder it took me so long to find the right load! Boy, have I changed my habits. I still clean the barrel, but I run a much higher round count between cleanings than before. Now, I shoot 100-200 rounds before I give the barrel a thorough cleaning. This goes with my general thinking--that some folks will benefit from added trigger time more than anything else. Spend more time shooting than loading 'perfect' ammunition or cleaning. Squeezing that last quarter-minute out of your groups won't do you any good if you can't hold one MOA or you can't read wind conditions. MORE TIPS from Brad Sauve. 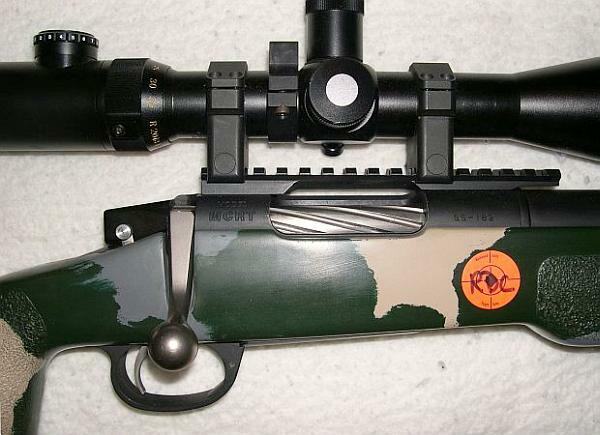 This rifle carried Brad Sauve to a 2004 U.S. Nat'l F-Class win in TR (Target Rifle) Class. It features a McMillan A-2 tactical stock with saddle cheek piece, plus Badger Ordnance rings, bases, trigger guard, and floorplate. The barrel is a Schneider heavy target contour with a 1:11.25" twist, optimized for 175gr SMKs. 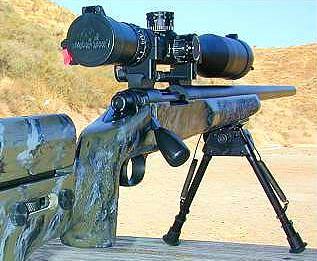 With a 12-42x56 NightForce Benchrest scope on top, the rifle weighs 17 pounds, 15 ounces. Brad tells us, "the unifying theme of all the components would be 'strong and heavy'." You'll see a wide range of barrel lengths and twist rates on precision .308 Win rifles. At one end of the spectrum, a tactical shooter who needs a compact, quick-handling rifle, may select a 20" barrel. The popular Rem 700 LTR (Light Tactical Rifle) features a 20" fluted barrel. On the other hand, Palma shooters, who need to keep a 155-grain bullet supersonic at 1000 yards, normally opt for barrels 30-32" in length. The extra length also provide a longer sight radius--a big benefit when using iron sights. A shorter barrel definitely delivers less velocity, all other factors being equal. With most powder/bullet combinations, you can figure an additional 25-30 fps per inch going from 20 to 25 inches. From 25 to 30 inches, add an extra 17-20 fps. From 30-33 inches you may pick up 15-17 fps or so, with appropriate powders. Here are some velocity estimates projected by QuickLOAD for 44.5gr Varget (ADI 2208) and IMR 4064 with a 168gr SMK set at 2.800" cartridge OAL, bullet not touching the lands. Powder 20" 21" 22" 23" 24" 25" 26" 27" 28" 29" 30" 31" 32"
Note: This is a software prediction only. Different barrels will perform differently based on a variety of factors including groove diameter, land configuration. Primers, seating depths, and powder lot variations can affect the numbers significantly as well. A 1:10" twist rate will let you shoot the popular medium and heavy 30-caliber bullets up to the 210-grainers from Berger and Sierra (provided your barrel delivers enough velocity for the heavy bullets). A ten-twist can also work well with the lighter projectiles. John Whidden, who won the recent U.S. Palma Team Trials, has had great success shooting 155gr Bergers with a Broughton 10-twist 5C barrel. A 1:11" twist, found on many factory rifles, is a good compromise. Palma competitors using the Sierra or Lapua 155s have favored 1:12" or 1:13" twist rates, with the theory being that a slower twist rate may offer better velocity since there is less friction in the barrel. A 1:13" twist is fine for deer hunters who prefer a 150gr-class bullet moving 2850-2900 fps. Because so many .308s are in use, and because the military has standardized loads, scope-makers are able to offer scopes with internally-marked holdover points for various distances. Leupold or Burris isn't going to do this for a 22 WallDog or .375 H&H shooter, but if you have a .308, you're in luck. For example, Elcan makes scopes with .308 Bullet Drop Compensation calibrated into internal reticles. U.S. Optics sells scopes with built-in BDC based on M118 LR ballistics. A few other scope makers have scopes with reticles designed to match the ballistics of Federal Gold Medal Match or NATO 7.62x51 ball ammo. At right is Leupold's SPR (Special Purpose Reticle), calibrated for 7.62x51, 175gr ammo. If you shoot one of these standard loads, and IF you nearly always shoot at one elevation, a BDC reticle can be very handy. You can move from one distance to another without the need to spin knobs or read click values off a come-up table. Even if you don't shoot a standard load, if you use a Leupold Scope, the Leupold Custom Shop can provide a custom-calibrated reticle with hold-over points expressly matched to your load and rifle. However, a BDC reticle is not a perfect solution. If you change your load, or even if you change elevations, the hold-over points will be off somewhat. For this reason, a better solution may be a drop-compensated elevation turret. Using this device, instead of selecting a particular number of clicks up or down, you simply turn the knob to the indicated yardage on the turret. Again, the Leupold Custom Shop can create calibrated Bullet Drop Compensation (BDC) dials for Leupold scopes. For all major scope brands, Kenton Industries sells a "Tuned Trajectory Compensator" knob calibrated for either factory or custom loads. The laser-etched aluminum knob is marked in yardage. Finding your come-up is as easy as spinning the knob to your intended distance. Keep in mind however, that the knob's calibration is tied to ONE load and ONE altitude. Kenton also offers a similar device for windage, which it calls a "Tuned Windage Compensator". If you regularly shoot the same load at the same (or nearly the same) elevation, a BDC knob can be very effective. Just "dial your distance" and center your cross-hair on the target and you're good to go. You can always switch back to the factory knob if you want to shoot a different load, or shoot at a different elevation. "If the shooter is engaging a target between marked distances, for example 450 yards, he will have to guess or look up in his data which click value between the 400 and 500 yard markings to use--that defeats much of the utility. I generally do not like BDC-calibrated knobs. The primarily reason is that to use their full utility, the shooter is locked in to one load at one set of environmental conditions. If the current batch of powder is 50 fps faster, or he goes up 3000' altitude, the BDC numbers are off and he has to add a correction. At this point dialing a direct mil or MOA value would be the same amount of work. This might not be an issue for a guy who only hunts or shoots in one location, but many tactical/competition shooters train or compete all over the place. Last year I shot matches from 700' to 7000' altitude. The same dope doesn't work at different altitudes. For windage correction I generally prefer to use reticle features (e.g. mildots, not BDC reticles) to hold off for wind in field/tactical type shooting because I hardly ever shoot more than two or three rounds (and often just one) at a single target before transitioning to the next one. Dialing windage is just one more thing to do before making the shot. Wind changes can happen suddenly and it's impractical to adjust a windage knob with every angle change or let-off. Finally, I've seen more guys mis-dial windage based on feedback from a miss than I've seen errors from holding off slightly." One reason the .308 Win is so popular is the availability of very inexpensive 7.62x51 military surplus ammo. As explained in more detail above, a 7.62x51 chamber is NOT the same as a SAMMI-spec .308 Win chamber. Nonetheless it is normally safe to shoot 7.62x51 NATO-class ammo in your .308 Win because current .308 Winchester rifles are designed for higher maximum pressures. Among the many types of military ammo sold to consumers, there is the "Good Stuff", namely Lake City M118 LR ("Long Range"), and everything else. The M118 LR is the true milspec ammo issued to U.S. military snipers. Boxer-primed and loaded with Sierra 175gr MK projectiles, M118 LR rivals some commercial match ammo for accuracy. Tests by SniperCentral.com reported the M118 LR produced .5 MOA to .7 MOA groups in some rifles. Note: M118 LR has a thick sealant right at the case mouth. Shooters report that if you re-seat the bullets just about .020" deeper this can break the sealant and potentially improve accuracy. Normally, your best source for M118 LR is the Civilian Marksmanship Program (CMP), which recently sold it by the case at $399.00 for 920 rounds. The CMP is currently out of stock, but it is available online from Ammoman.com, and Impact Guns. Expect to pay a lot more, however. 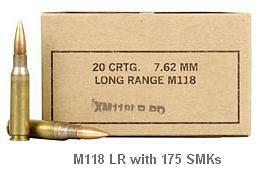 Ammoman sells M118 LR for $350.00 per 500, and Impact Guns charges $24.99 per 20-round box--way too much! After the M118 LR, you have a wide choice of ammo, the best of which might deliver 1.0-1.5 MOA on average. 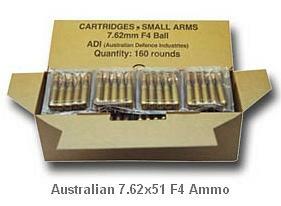 The Australian (ADI) ammo is popular because it is reasonably accurate and it comes in handy plastic blister packs--ideal for long-term storage. Zak Smith reports he and others "are getting sub-MOA from the Australian surplus". Regular Lake City Ammo is readily available and offers reloadable boxer-primed brass. This editor has had very good luck with certain 1988-89 lots of Berdan-primed British Radway Green ammo in individual brown boxes. It shot sub-MOA in an M1A. However some of the older Radway in ammo boxes with fitted trays is not so great. FNC (Portugese) ammo has proven reasonably accurate and reliable. Occassionally you'll see some Hirtenberger 7.62x51. That's worth checking out, because newer lots are Boxer-primed (reloadable) and the brass is quite good. Q: Whats the best technique for shooting a .308 from bipod? Does Free Recoil ever work? Froggy: Free recoil will not produce the desired result with a .308. I tried that more than a couple of times. No dice. My technique works for me. But I won't argue with the way Tony Boyer shoots a 6PPC. And don't even think of shooting free recoil off a bipod. It just doesn't work because you don't want those legs bouncing backwards out of control. When shooting with a bipod it is essential that the bipod be adjusted properly for elevation and cant. The bipod must be of good quality. I like Harris swivel bipods with notched legs. When the bipod is set up properly, and if you push slightly forward with the rifle to firm up the 'pod's legs, excellent results can be realized with lots of practice. Q: You've mastered the "hard-hold" shooting style. How do you grip and steady the stock? Froggy: I use a classic wrap-around grip on the stock, similar to that of most professional tactical shooters. The rifle is pulled hard back into my shoulder and the tip of the pad of my right index finger on the lower part of the trigger. 90% of my focus after I'm dialed in is in the trigger pull. The other 10% is in the cheek weld and the crosshair to target relationship. Again trigger pull will kill you if the correct technique is not employed. The trigger must be squeezed gently straight back; any twisting, pushing or moving side to side will put you out of business. I practice in the dark by dry firing repeatedly. Most of my feel training is done in a dark room, no distractions, my sensitivity and muscle memory are greatly enhanced. Q: What is best advice to newbies looking to improve their accuracy? Froggy: The most accuracy that you can get out of a .308 (or any centerfire rifle for that matter) will always be by handloading your own ammunition. You can tune the load to your gun and realize its full potential. My suggestion to a new shooter would be to get some good instruction from a pro, take a class in precision shooting, read everything you can about all of the shooting sports and get on the internet if you have access and talk to forum groups. Most of these guys will give you tons of great advice. Log on, ask good questions, be respectful, listen, learn and practice as much as you can. There is still no substitute for trigger time. I shoot 3500-4000 centerfire rifle rounds a year in three different calibers. Plus a lot of rimfire. For more of Froggy's Shooting and Reloading Tips, CLICK HERE. 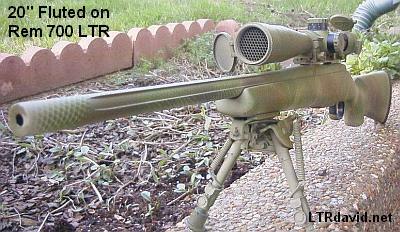 A proper military sniper rifle, the TRG-22 is an excellent platform for F-TR competition. The fully-adjustable, ambidextrous stock is comfortable and well-balanced. The tri-lug action is smooth and solid, and the rifle enjoys one of the most accurate factory barrels in production. SAKO's trick cantilever bipod has some advantages, but it's overpriced and most TRG-22 shooters prefer to use a Harris. Normal retail is over $3100 now, but TRG-22s hold their value well. If you shop around you can find a near-new one for around $2600 without bipod or muzzle brake. A couple years ago, when American Rifleman tested the .308 Tikka Master Sporter (then priced under $800), the gun produced honest half-MOA groups with factory match ammo. The gun has a very nice, comfortable stock for prone work, with adjustable cheekpiece and fore-end rail. The trigger is crisp and the detachable magazine works well. All you need for F-TR work is a good scope and a Harris bipod. Sadly, the Master Sporter is no longer imported. But if you look hard, you can find one. The other option is to buy a basic Tikka 595-actioned rifle and send it to Mac Tilton at MT Guns. Mac carries spare Master Sporter stocks and accessories. Though it boasts a top-of-the-line McMillan stock, good barrel, +20 MOA scope rail, and sturdy pre-64 controlled-feed m70 style action, the FN SPR (Special Police Rifle) never really caught on with the tactical crowd. Consequently, you can often find this gun on sale for $1100-1300 NIB, depending on accessories. As of 1/1/06, CDNN still has a few overstock FN SPR A1s for under $1200. With a bit of bedding work and some trigger tuning, these guns are capable of winning club-level F-Class matches out of the box. Copyright ? 2005, AccurateShooter.com | 6mmBR.com, All Rights Reserved. Rem LTR Photo courtesy LTRDavid.net, used by permission. Factory ammo photos courtesy OutdoorMarksman.com, used by permission.